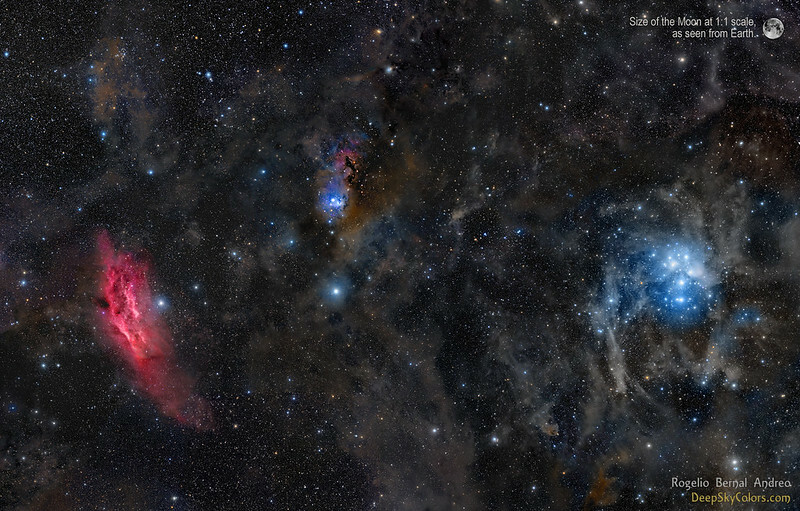 About three months ago I started working on a project of a view I had already done a few years ago but that I had never been quite happy with it: the area in the Perseus/Taurus constellations where we can see a vast field that features both the California nebula and the famous Pleiades, as well as other less known objects. I used both data from previous images as well as 57 hours of exposure during these past three months (40 hours of Luminance data and 17 hours of RGB). As usual in my deep-sky images, my interest is not only the main characters but also anything that might be there as well. In this case, numerous molecular clouds of dust reminding us that the night sky is often filled with structures that often escape the eye, and even the camera. To give an idea of the vast field of view covered in this image, on the top-right corner I've placed an image of the moon at scale (as seen from Earth).